Yako Casino is one of the newer online casinos around. In their own words: they’re all about a customized casino experience and really getting to know you. We’ve decided to test that out and share our experience with you! After opening the site we immediately understand why Yako Casino is becoming more and more popular by the day. The layout of the page and the bright purple and yellow colour scheme are very inviting and attractive to the eye. The site has a modern feel, yet is set up in a way that even new online players will navigate it without any issues whatsoever. It’s clear that Yako Casino understands the importance of having a ‘local feel’ when playing, as they offer their site in no less than five languages: English, German, Swedish, Finnish and Norwegian. The registration process literally takes two minutes, trust us – we’ve tested it. You can sign up via your email address, making the site accessible to all online players. The local feeling continues when you have to select your country and currency during the signup process. You finish your registration by entering some personal information, and that’s it. Easy Peasy. To welcome new players Yako Casino offers a great welcome bonus. 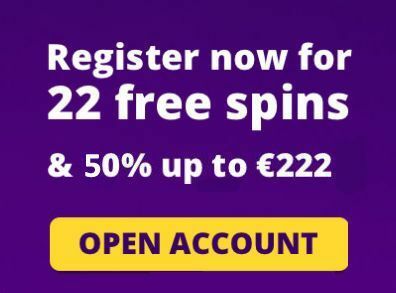 The welcome bonus consists of bonus money and free spins. The free spins are added upon registration, giving new players the opportunity to try out the full functionalities of Yako Casino. Each new players received 22 free spins, which can be players on Starburst, Joker Pro or Finn & the Swirly Spin. Only Canadian players can play the free spins on different slots, namely Lightning Hot, Book of Aztec or Admiral Nelson. They will be activated on the slot that is opened first. Players will also receive a deposit bonus of 50% up to a maximum amount of £/$/€222. The fun doesn’t stop here though – Yako Casino regularly prepares additional promotions and offers for their players. A great example are the Cashback Mondays. Every Monday, loyal players will receive 10% cashback on the losses they made the previous week. Under the ‘Your account’ section on the site you can easily check your transaction history, but also request withdrawals and check your pending withdrawals. The minimum withdrawal amount is only €10. The duration of the withdrawal process depends on the payment method you use. Whilst you should receive withdrawals to credit/debit cards within 3-4 work days, withdrawals to e-wallets are processed instantly. In the left top corner of the site you can find the main menu that allows you to easily navigate to different parts of the casino. To see an overview of popular games as well as an array of categories, simply click on the Casino option. If you already know what type of game you enjoy playing, you can easily navigate to the section of your choice in the menu as well. Games are divided in categories such as slots, classic slots, live casino, table games, jackpot and video poker. The game selection is enormous. Both the table games and the live casino section offer a great variety of table games. The live casino even counts more than 60 high quality games offered by Evolution Gaming. Furthermore the slots section is packed with a staggering range of hundreds of slots. With this many games to choose from, you’ll never be bored on Yako Casino. Did you recently play a game you loved, but forgot the name of? Don’t worry! Simply go the “My Account” section, to check out your casino history. Here you can check out the history of games you played, which you can even narrow down to specific months or even days for easier use. Yako Casino offers games from top providers like NetEnt, Microgaming, Evolution Gaming, and Amatic Industries. If you have any questions about Yako Casino you’re sure to find the answer on their extensive Help page. Otherwise you can always count on their support agents. Yako has one of the friendliest support teams we’ve encountered so far. We were connected to their livechat within seconds and assisted very professionally. From the smooth registration process to the personal suggestions, we were very impressed by both the look and feel of Yako Casino. If you’re currently looking for something new or deciding on your first online casino, Yako is definitely worth a visit!